Rawle Martin, or "Raleigh" as he was affectionately called was born on November 22, 1931 in Harlem, NY. Unexpectedly our Precious Lord came early in the morning on January 20th, and peacefully took Rawle home in his arms to eternal rest. Rawle was preceded in death by his mother Constance, wife Ida, brother Sam, and sister Beryl. Rawle was united in marriage to Ida Cambridge, and from this union two daughters were born; Marsha and Valerie. 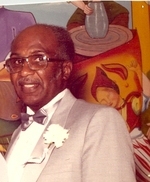 Rawle served in the U.S. Army, and was stationed in Korea and Okinawa. He was honorably discharged in the mid 50's. He also worked at Republic Aviatiion, and retired from TWA. The African Proverb, "When an old man dies, a library burns to the ground" appropriately describes Rawle. Rawle was a very intelligent, self taught man who knew a little bit about everything. Not only was he very astute repairman, always willing to lend a hand whenever asked, he was the consummte historian. On his birthday November 22, 1963, he came to be enlightened, when he witnessed on TV the assassination of JFK. On that day he came to the realization that the news was witholding pertinent information, that would only be reveled via intense study; information he was delighted to share with anyone willing to learn. He leaves to cherish his memory daughters Marsha and Valerie, grandsons Christopher and Jason, sister Myrtle, cousins Raymond, Ione and Eleanor, and host of nieces, nephews, extended family and friends. To send flowers to the family of Rawle Martin, please visit our Heartfelt Sympathies Store.